St. Basil the Elder, father of St. Basil the Great, was the son of a Christian of good birth and his wife, Macrina (Acta SS., January, II), both of whom suffered for the faith during the persecution of Maximinus Galerius (305-314), spending several years of hardship in the wild mountains of Pontus. St. Basil the Elder was noted for his virtue (Acta SS, May, VII) and also won considerable reputation as a teacher in Caesarea. He was not a priest (Cf. Cave, Hist. Lit., I, 239). He married Emmelia, the daughter of a martyr and became the father of ten children. Three of these, Macrina, Basil, and Gregory are honoured as saints; and of the sons, Peter, Gregory, and Basil attained the dignity of the episcopate. 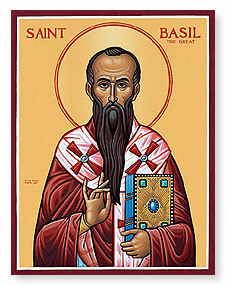 Under the care of his father and his grandmother, the elder Macrina, who preserved the traditions of their countryman, St. Gregory Thaumaturgus (c. 213-275) Basil was formed in habits of piety and study. He was still young when his father died and the family moved to the estate of the elder Macrina at Annesi in Pontus, on the banks of the Iris. As a boy, he was sent to school at Caesarea, then "a metropolis of letters", and conceived a fervent admiration for the local bishop, Dianius. Later, he went to Constantinople, at that time "distinguished for its teachers of philosophy and rhetoric", and thence to Athens. Here he became the inseparable companion of Gregory of Nazianzus, who, in his famous panegyric on Basil (Or. xliii), gives a most interesting description of their academic experiences. According to him, Basil was already distinguished for brilliancy of mind and seriousness of character and associated only with the most earnest students. He was able, grave, industrious, and well advanced in rhetoric, grammar, philosophy, astronomy, geometry, and medicine. (As to his not knowing Latin, see Fialon, Etude historique et littéraire sur St. Basile, Paris, 1869). We know the names of two of Basil's teachers at Athens — Prohaeresius, possibly a Christian, and Himerius, a pagan. It has been affirmed, though probably incorrectly, that Basil spent some time under Libanius. He tells us himself that he endeavoured without success to attach himself as a pupil to Eustathius (Ep., I). At the end of his sojourn at Athens, Basil being laden, says St. Gregory of Nazianzus "with all the learning attainable by the nature of man", was well equipped to be a teacher. Caesarea took possession of him gladly "as a founder and second patron" (Or. xliii), and as he tells us (ccx), he refused the splendid offers of the citizens of Neo-Caesarea, who wished him to undertake the education of the youth of their city.